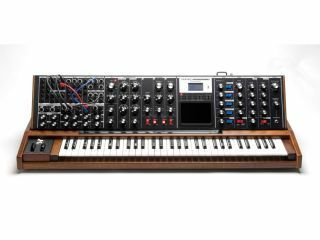 Moog Voyager XL: it doesn't exist yet, but if it did, it might look something like this. It looks like Moog is set to announce the Voyager XL, a new feature-packed 61-key monosynth. There's been no official announcement as yet, but it seems that a retailer accidentally posted pics and specs that have since been removed. Whoops. This hasn't stopped them appearing all over the internet, though: the Moog Voyager XL looks like a standard Voyager that's been souped up with a VX-351 Control Voltage Expander, CP-251 Control Processor and ribbon controller. The Voyager XL is sure to get fans of analogue synth hardware drooling, but with a projected price point of $4,995, it's debatable how many of them will be able to afford it. The synth is predicted to be released in November - we'll bring you the full details as and when they arrive.